On Sunday July 1st 2012 at ACMI Federation Square two friends and I headed into Melbourne for newly opened exhibit Game Masters. Game Masters houses a collection of over 120+ playable games showcased by their creators. 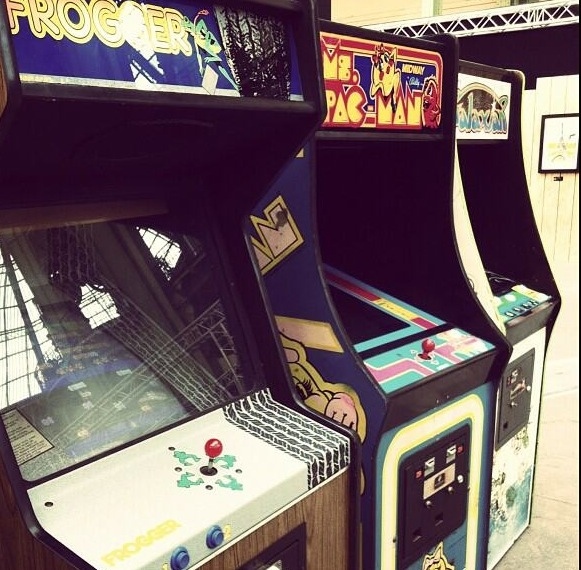 The exhibit focuses on key game designers or fathers of the gaming world who through their creativity have influenced and changed the way we see and love to play games today. The exhibit includes the works of around 35 game designers spanning over the last 40 years. 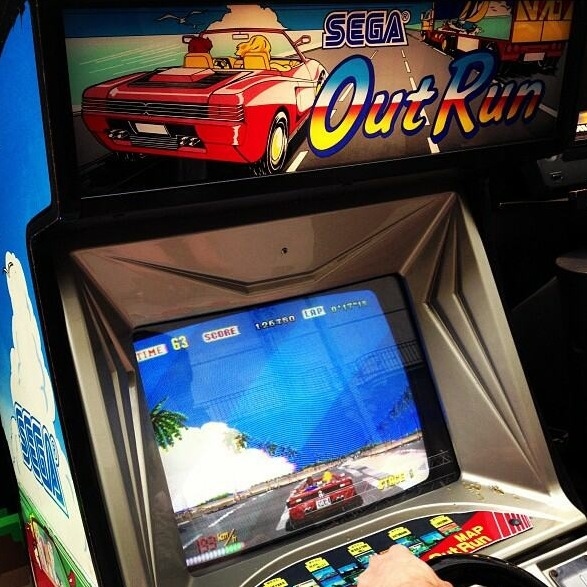 Game Master’s had three Yu Suzuki arcade games available to play OutRun (1986) Sitdown standard version, Hang-on (1985) Sitdown Version and Virtua Fighter (1993). 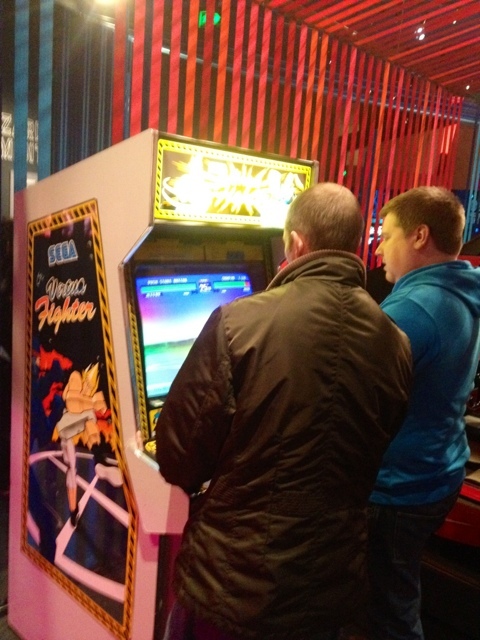 I was a little disappointed to find that OutRun had ‘Taken a Hit‘ after three days of opening to the public, but that’s the unfortunate reality of old arcade machines. The machine visually was a pretty tidy example. 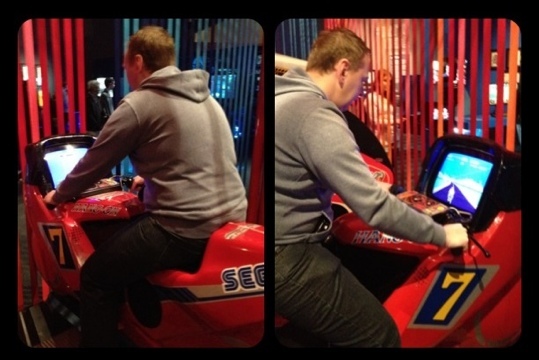 Let’s wipe away those tears and get on to the Hang-on bike, it’s got to have be 20 years since I last jumped on this arcade classic. Hang On was and still is 27 years later an amazing game and arcade simulator, Suzuki’s games just don’t seem to age. Virtua Fighter was the first Polygon fighting machine and was a huge leap forward in arcade fighting games,that’s probably why the series has a permanent place in the Smithsonian Institute in the U.S. 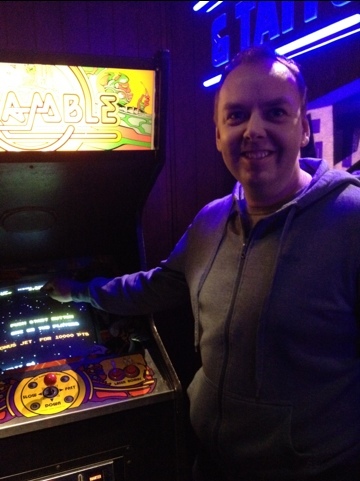 This machine was in great condition and was still good fun in a 2 player battle with friends. Yu Suzuki’s area also included a playable Shenmue on the SEGA Dreamcast and a rolling interview with the man himself. 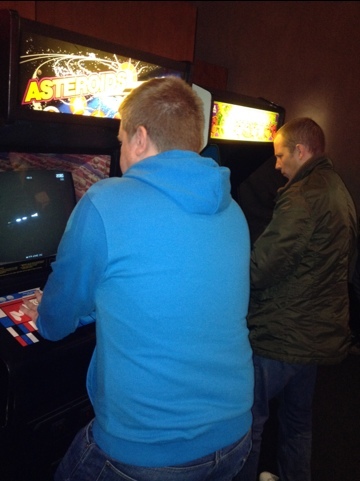 When you first arrive at the entrance to Game Masters you are taken back in time to the 70’s era of classic arcade machines titled Arcade Heroes. 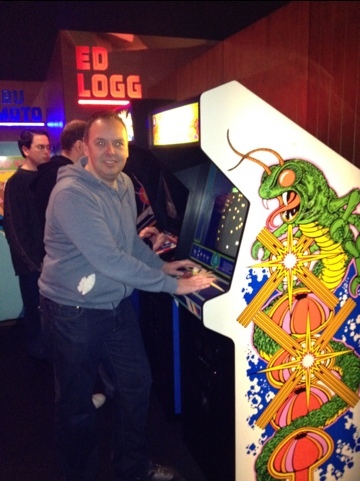 If your in your late 30’s or early 40’s you will want to relive your childhood and probably spend hours here like I did. 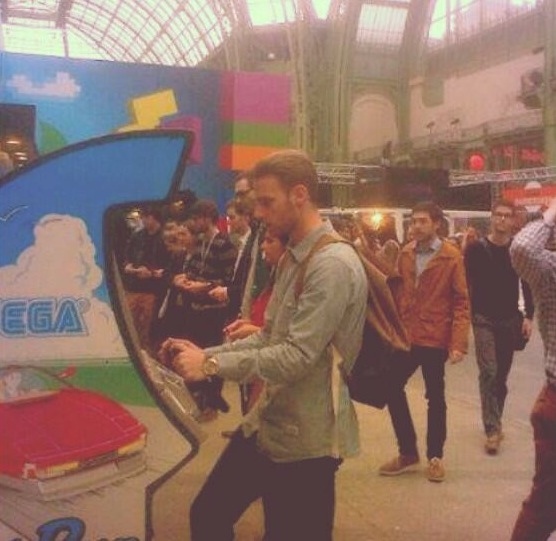 Beyond the Arcade Hero’s section was a wall containing consoles of the past. It was great to see the appearance of many Japanese released machines like the PC Engine, Virtual Boy, Super Famicom and the US SEGA Nomad handheld. As you walked further into the exhibition things became more up to date with newer releases on the XBox 360 + Kinect and Playstation 3.Mobile and tablet gaming was also present. Special mention should go to the excellent look of the Exhibition around the Kinect dancing stage and 3D Child of Eden experience. 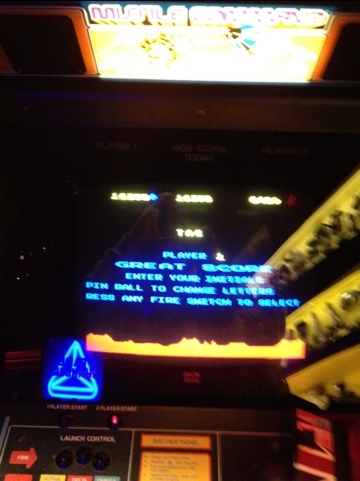 I could quite easily spend another day at Game Master as I only touched the surface of the more modern areas. Get yourself, family and friends to Game Masters at ACMI for a truly great day out and experience, there’s something for everyone. Below is some information on the event that I translated. The cultural space consists of 26,241,000 light clusters installed in 3,700 m² of metal frame that surrounds the building Fiesp. 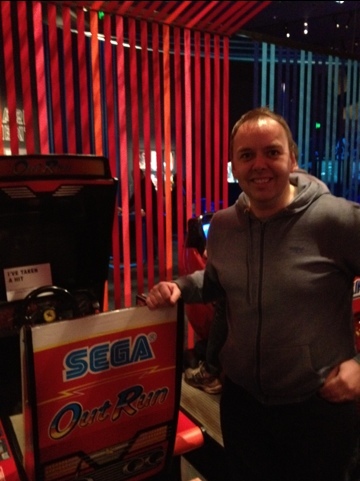 Six gaming based works of art were transmitted by contemporary artists, three of them interactive….including SEGA’s OutRun. 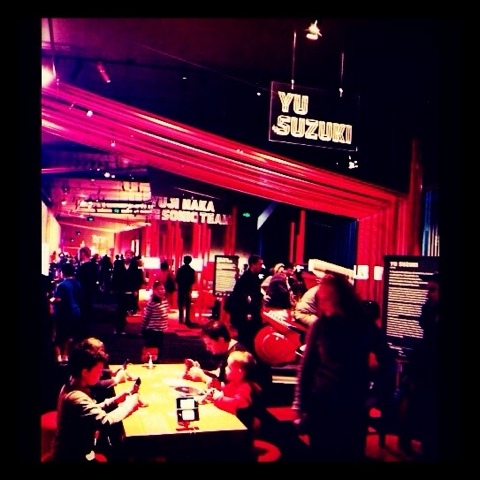 The exhibition PLAY! Inspired in the world of video games was curated by Marilia Pasculli and Danish Tanya Toft, who specializes in new media and digital art. According to Marilia, Game Art is considered one of the most interesting artistic events emerging today, not only by dissolving the boundaries between different art forms, but also to get an interactive potential. 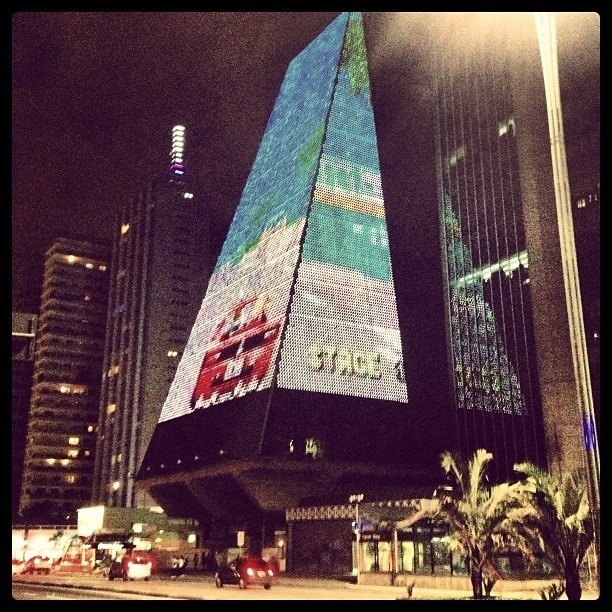 “The way uncultured entertainment of videogames has achieved an important position in the intellectual aesthetic in the art world,” says the Brazilian. 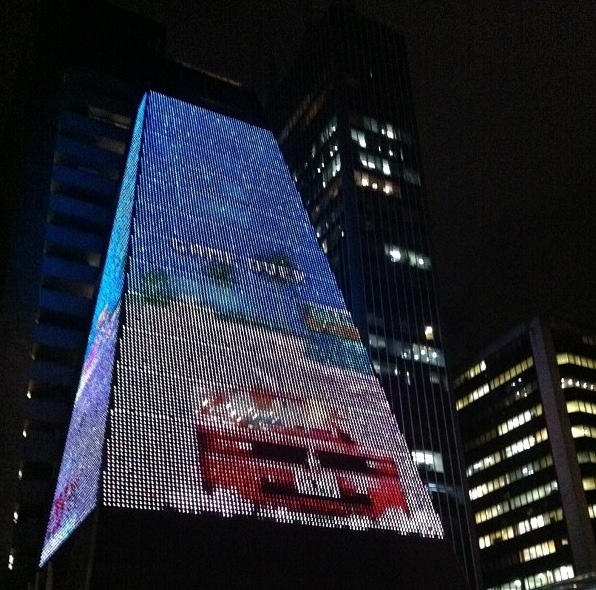 The work consists of video sequences of the game “OutRun”, 1986, released by SEGA and designed by Yu Suzuk. In the original game, the player controls a red Ferrari, with third-person perspective. The car already has a girl in the passenger seat. They pass by the road in a nice landscape. 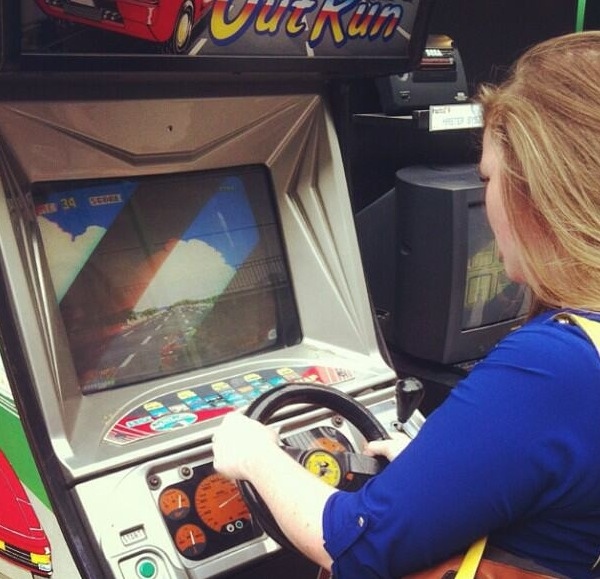 The game “OutRun” was one of the first driving simulators that gave the player the option to choose routes, which may have inspired the artists to make this game to be modified – and even instill some hope in the human being so that it retrieves the control of cultural development. 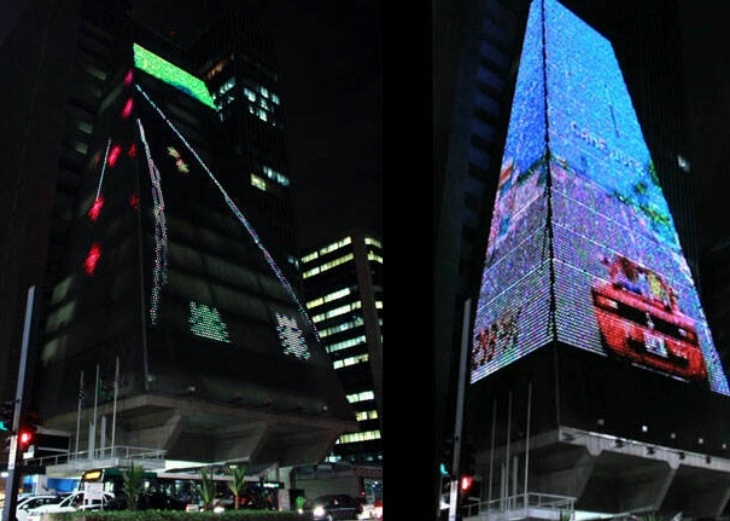 Imagine walking through the city and seeing this….awesome! 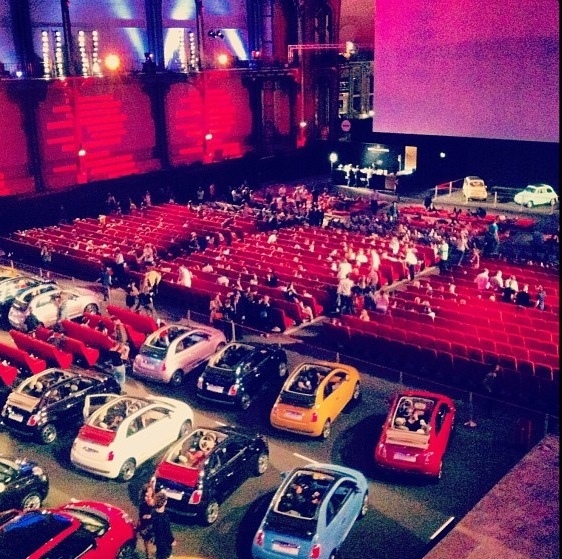 Cinema Paradiso was held in a 1000m2 area covering various forms of entertainment including a mock up Drive-in Cinema sponsored by Fiat that played classic movies each night. A Roller skate American Diner and a vintage arcade with approximately 100 classic arcade machines and games consoles. 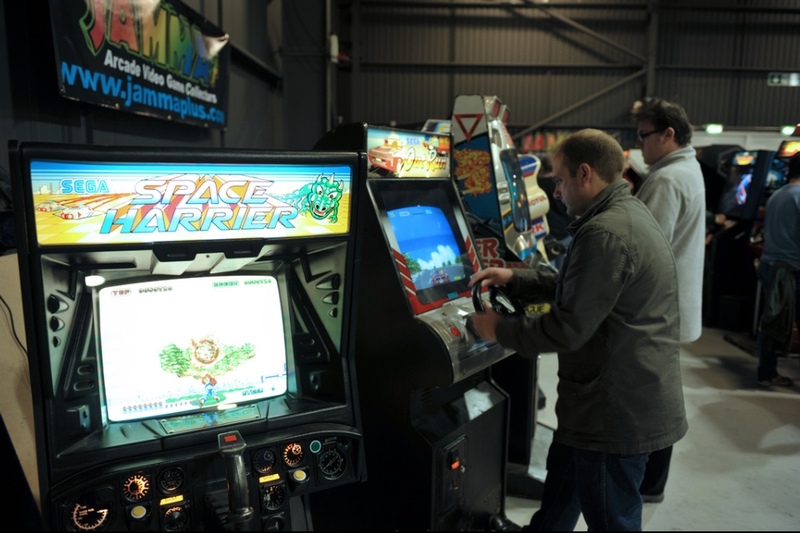 The classic arcade machines included Pong, Pac-Man, Donkey Kong, Space Invaders, Asteroids, Frogger, After Burner and OutRun to name a few. Let hope that this idea comes takes off and comes to other countries. 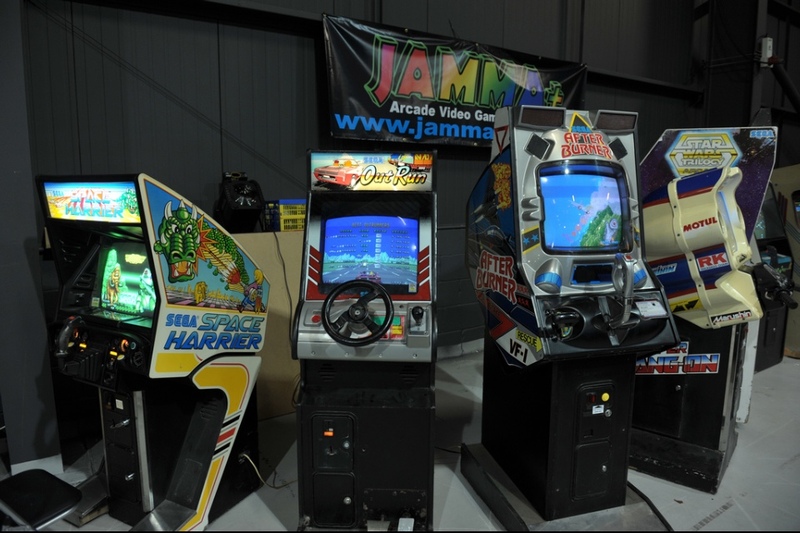 Not to sure on the details of this event, it may be a Replay Expo where members from the Jamma Plus forums bought along their arcade treasures. These pics deserve a place in the ‘Real Shenmue You Arcade’ and would make any Yu Suzuki fan want to take a visit. What a great image of the cream of the crop 80’s SEGA Arcade machines! Above – Space Harrier, OutRun, Afterburner and Super Hang on!